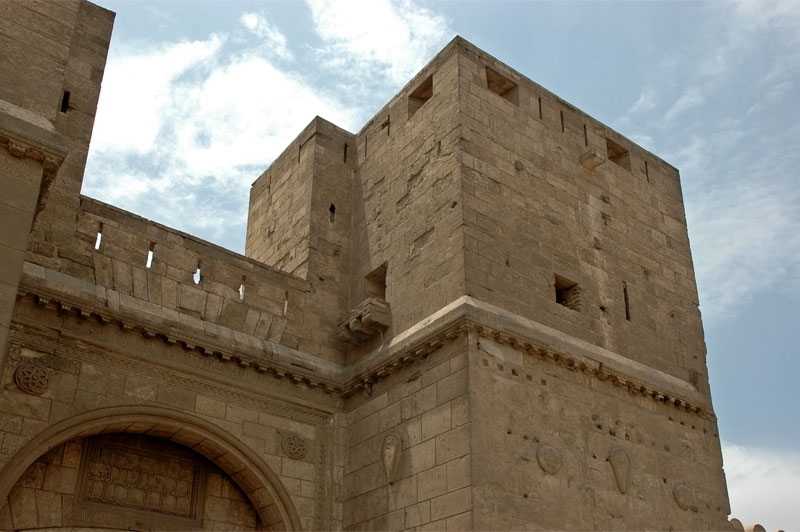 Bab El Nasr in Cairo, which is placed at the northeast corner of the enclosure of Fatimid Cairo, consists of two great square towers, solid for two-thirds of their heights, flanking a very fine arched gateway which is set back 4.54 m. From their front face. At the back of latter are a great square bay, 1077 m. Long and 8.17 m broad covered by an interesting Vault or cross vault and forming a covered roadway between the two towers. This Vault ends flush with the near face of the towers. The whole structure measures 24.22 m. in width, 20.47 m in depth and 20. 89 m in height (from the sill of the great gateway) behind the eastern tower, is a massive oblong tower containing a fine spiral staircase 1, 65 m wide leading to the platform over the vaulted roadway. The square gateway towers are built in three storey, the two lower of which are solid, the lower storey is 6,61 in height, measured from halt-round moulding at its base, or 37 m more if measured from the sill of the entrance. The seventh course is remarkable for a series of stone circles, placed about 1. 85 m a part run all round the outer faces. The circles are the ends of a series of columns let into the wall as a band between the rubble core and the outer faces of dressed stone. The second storey which is 6.77 m high to the top of the level is built slightly in retreat on the first, it, is composed of ten courses, almost entirely of stretchers, varying from 95 cm to 23 in length. A remarkable decoration appears here in the form of three shields on the front of each tower and one with a sword on each of the sides next the archway, half the shields are circular the other half are round above and pointed below after the fashion of the roman shields. At the summit of this storey on the front and inner faces only in the dating inscription a fine band of Kufic and above, this a curious cornice bevelled off above and supported below by a series of modillions almost classical in form. The lower edge of the cornice thus supported is decorated with a band of simple ornament, recalling the egg and bead motive.